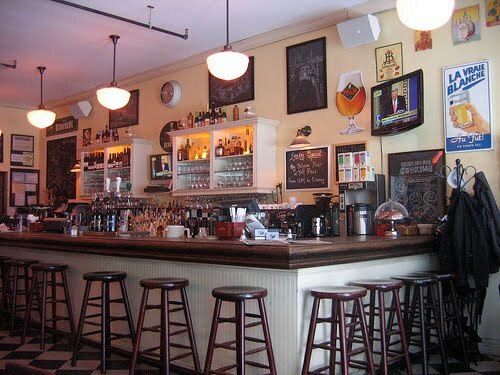 With 3 visits in almost as many weeks, Petite Abeille has fast become one of my favourite hangouts in the City. 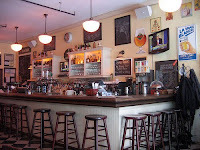 The tiny Tribeca restaurant specializes in Belgian cuisine and is very much styled like a low key bistro, complete with a long dark wood bar and checked tablecloths. Tintin books and artwork adorn the walls and complete the look. I have to admit "half priced wine" Tuesdays, while being very bad news for Wednesday mornings, is a big part of the draw of this place. But the even bigger draw is the fantastic selection of mussels dishes they are famous for. I have a particular fondness for the morish, calorie-ladden Moules Grand-Mère which are prepared in white wine, cream and bacon and served (as with all the other mussels dishes) with salty, crispy French fries. But the more traditional Moules Marinière in their heady garlicky broth are excellent too. As my friends all love the place as well, I have a distinct feeling that I will be spending a lot more Tuesday nights at Petite this summer ... here is to hangover Wednesdays!